Steel security doors provide extra protection for your home or business premises against break-ins. All too often ordinary front doors can be easily forced open with simple tools and burglars can gain entry to your property very quickly. At Thornhill Security we stock the top brands from the best manufacturers like Chubb, Robust and Shield. Our high security steel door sets come with a range of locking systems from 12 point locking mechanisms to multi lock systems. 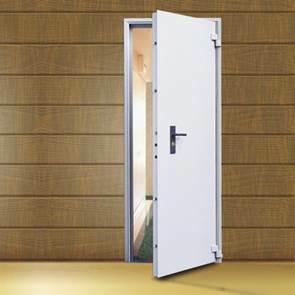 Drill and impact proof, these DDA Compliant doors have Flat Stainless Steel Thresholds and an anti-jemmy bar lip to prevent crowbar entry by intruders. If your security doors are needed for a commercial building we can fit them with panic bars for quick release allowing personnel to escape quickly in the event of a fire or other emergency. We have a full range of fire exit steel security doors and can arrange fitting for you too. Give us a call at Thornhill on 0117 9674994 for further advice on our security doors and door sets. Alternatively you can view a sample of steel security doors below. If you need you more help and advice when choosing a steel security door, or any of our other specialist products call our team on 0117 9674994. You can also find useful information on our FAQ and blog pages.